Theatre doesn’t only happen beneath a proscenium arch, site-specific productions take performances out of the theatre and place them in unexpected real-world settings. Locations for site-specific productions usually have some tie-in to the content of the show, but can be as diverse as parks, bars, museums, churches or parking garages. This week there are some really awesome-sounding site-specific performances taking place around the city that are definitely worth checking out. Following hot on the heels of their acclaimed production of The Agony and Ecstasy of Steve Jobs, Outside the March is re-mounting their runaway hit from the 2011 SummerWorks Festival, Mr. Marmalade. Staged inside a real-life Kindergarten classroom at Holy Family Catholic School, the show is a dark comedy about a four-year-old named Lucy and her increasingly disturbing and destructive relationship with her imaginary friend, Mr. Marmalade. 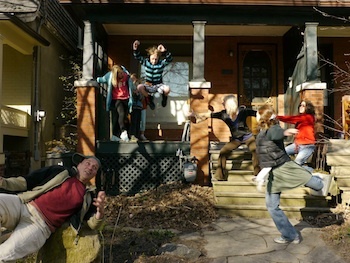 In Porch View Dances: An Urban Landscape Performance Initiative, fifteen residents of Toronto’s Seaton Village neighbourhood perform new choreographed dances on the front porches of their own homes, culminating in a celebratory “Flock Landing” in Vermont Park. The grounds and buildings of the Evergreen Brick Works are the site of Memory in the Mud; part educational tour, part site-specific theatre, this roving historical play celebrates the unrecognized Canadians who’ve lived or worked at the Brick Works and helped build the city of Toronto. Performances start Wednesday, July 11 at 3:00pm, and will run most Wednesdays and Sunday afternoons over July, August and September. Please see ebw.evergreen.ca for schedule.